For the Red Fox winter is a tough time in the Cold Forest. Gerald and Buff Corsi, Berkeley Digital Library. In the Cold Forest winter, any animals that are active are working full-time to stay alive, continually searching for food and always losing weight. Long severe cold spells, food shortages and deep snow are challenges even though animals are adapted to survive. In winter, bats, ground squirrels, marmots, jumping mice, bears and other true hibernators become inactive. By entering a state of deep dormancy they lower their body temperature to just above freezing and reduce their activity for several weeks. Fat accumulated throughout the summer provides vital energy during hibernation. 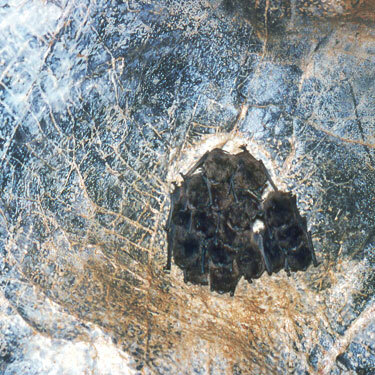 Hibernating Little Brown Bats clustered on the ceiling of a cave. David Nagorsen. Shallow hibernators such as chipmunks have short bouts of dormancy lasting only 12 to 24 hours, relying on food stored in their burrows for winter energy. Most mammals do not hibernate. They remain active throughout the winter and have various strategies to conserve heat. A thick coat of winter fur increases insulation by up to 20 per cent. Shrews and small rodents like mice and voles stay under the snow, finding food in an environment of constant temperature and humidity. Temperatures below the snow can be up to 25°C warmer than on the exposed surface. Winter nests constructed of dried plants and fur provide additional insulation. Many small animals live communally in winter, huddling together in their winter nest or den to reduce heat loss. Snowshoe Hares and Lynx move easily on top of snow. Dense fur on the soles of their feet acts as snowshoes. Caribou don't sink in deep snow — large semicircular hooves and prominent dew claws located behind the main hooves prevent this. Snowshoe Hares and Ermines depend on concealment to escape predators. In winter, they acquire a white coat that provides effective camouflage against a snowy background. 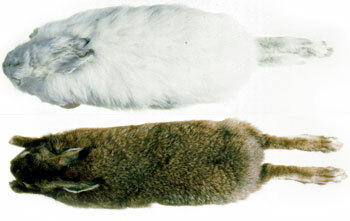 Snowshoe Hare skins in white winter and brown summer pelage (fur). David Nagorsen. Many mammals place large food stores in their burrow or near their winter nest to avoid winter shortages and foraging in extreme weather. 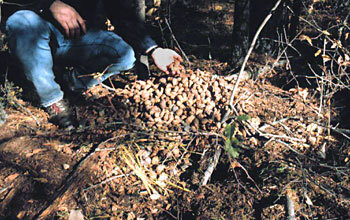 The Red Squirrel's large food middens can contain thousands of cut conifer cones. Cone middens of the Red Squirrel. Karl Larsen.